Yesterday evening, the citizens of New York City enjoyed an awesome spectacle of the sun setting exactly in line with the east-west streets of the Manhattan grid. 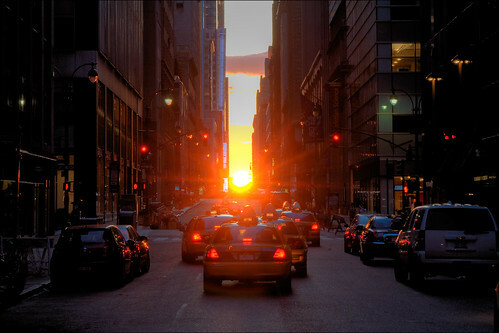 Known as Manhattanhenge, a term coined by Hayden Planetarium's director, Neil deGrasse Tyson, the phenomenon is just like what you see at Stonehenge at the summer and winter solstices. But in New York City, the special days are May 30 and July 12. This is due to the fact that the grid, made up of streets running east to west and avenues running north-south, isn't exactly in line with the compass. It's offset 28.9 degrees east from geographic north. As Tyson suggests, I can just imagine the archaeologists of the future trying to piece together why Manhattan's streets are aligned just the way they are. What's so important about 28.9 degrees? Were May 30 and July 12 the holy days of this lost civilization? To save archaeologists the trouble, I decided to do my own digging, and called Joyce Gold, Manhattan history maven and NYC tour guide. Gold told me there's a really simple reason for why Manhattan's grid was drawn the way it was in the 1811 plan. The 28.9-degree tilt means the east-west streets run the shortest route across town from the Hudson River to the East River. However, Gold said, "There is at least one street laid out by a compass." That's Stuyvesant Street, which runs due east from 9th St. and 3rd Ave. to 10th St. and 2nd ave.
"A lot of people think of that as the crooked street in the East Village, but in fact it's the only straight one," Gold said. Manhattanhenge is one of the phenomena that reminds you just how dramatically the sun's apparent journey through the sky changes over the course of the year, thanks to the 23-degree tilt to the earth's axis. But there's another way, if you're patient, to see this in action. Thanks for using my image, but next time please have the courtesy to contact the image's owner to find out under what terms the image can be liscensed. Sorry about that, Nick. I added the citation to the image. We'll be more diligent in the future. Pretty great picture of the solograph, question is, was the New York version of stonehedge built purposely?